In the winter of 2017, a team of Wissahickon students took on the challenge of preparing a team of Honduran students for an international robotics competition known as the FIRST Global Challenge. The unstated mission was to show the world that these students from an impoverished village could compete on the world stage, if given the proper resources and support. For six months, Wissahickon students built prototypes, provided design advice, and communicated via Skype. Wissahickon Robotics Coach Alan Ostrow and his wife Wendi also visited Honduras to conduct onsite technical training for the students in their village of Camasca. As the design phase concluded and the event drew near, it was clear that this was not going to be your ordinary robotics competition. The diversity of the teams at the FIRST Global Challenge was staggering, ranging from an all-­‐female Afghan team to a group of Syrian refugees known as “Team Hope”. And as you would expect, there were also powerhouse teams from the United States, Canada, Korea, and Japan, all ready to compete for the world title. The competition also featured visits by many world leaders such as the President of the World Bank, the US Deputy Secretary of State, Media Mogul Ricardo Salinas, Ivanka Trump, and over 40 diplomatic officers, as well as 150 international media outlets. Also in attendance was a small crew of WHS students, Josh, Shivani, Joe, and Jiweon who traveled to Washington, DC and volunteered as FIRST Global event staff. So in addition to supporting Team Honduras, our students had the opportunity to help Team Africa, Team Nigeria, and Team Botswana as members of the FIRST Global volunteer staff. 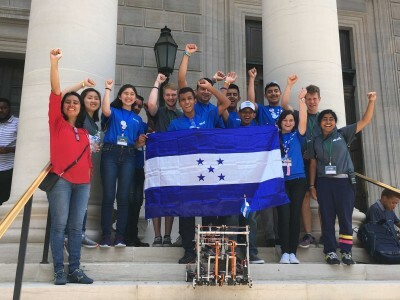 And then finally, on July 16th in Washington, DC, as young people from almost every nation on earth marched into Constitution Hall for the opening ceremonies, Team Honduras proudly took their place among the 163 teams in attendance. For two inspiring days, the youth of the world embraced their differences and worked side by side in a spirit of cooperation and friendly competition. At the conclusion of the competition, Team Honduras had played 6 brilliant matches and ultimately placed in the top 25% of teams worldwide. Team Honduras also ended the competition as the #3 team in all of the Americas, and the #1 Team in Central America, placing higher in the rankings than many industrialized nations such as Canada, UK, Russia, Japan, and Mexico. This final ranking was certainly a proud moment for the students of Honduras and the students of Wissahickon Robotics. However, something much more important happened in the past 6 months. In the end, the FIRST Global Challenge was a transformative experience as the Honduran and US students bonded together in common struggle. The students of both nations have been truly inspired by their own potential to change the world and are looking forward to the next FIRST Global Challenge, as the youth of the world assemble in Mexico City in July of 2018. Acknowledgements: Team Honduras would like to thank the following Wissahickon Students for their dedication to this partnership: Luna M., Jiweon M., Shivani S., Connor C., Josh S., Davis R., Joe T., Brianna R., Alex O., Ethan F., Ryan S., Katie S., and Chelsea R.
AMBLER, PA – August 22, 2016 – The Wissahickon HS FIRST® Robotics Team, Team 341, returned last week from an international outreach effort in China. The team, known as “Miss Daisy”, visited China from August 3-15. Students from Wissahickon and students from China came together during a 3-day Robotics Maker Workshop and a 4-day FIRST® Robotics Competition. The objective of these events has been to build up FIRST® Robotics in China, teaching Chinese students the value of teamwork, and that science and technology can be fun. The Robotics Maker Workshop was held at Fengxian Secondary Specialized School in Shanghai, China. 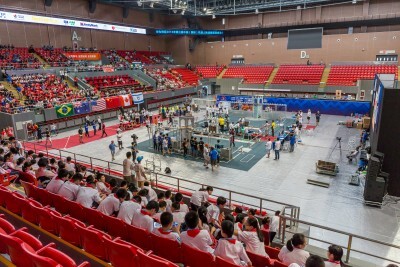 Teams from all over China came to be mentored by 15 international FIRST® teams from the United States of America, Israel, Canada, Brazil, and Australia. Invited international teams helped 20 Chinese teams add functionality to their existing robots for this year’s FIRST® Robotics Competition challenge, FIRST® STRONGHOLDSM. Team 341 mentored two Chinese teams: Team 9036, Zodiac and Team 9040, Flash. The China Robotics Challenge (CRC) followed the Robotics Maker Workshop, allowing the Chinese teams to put their designs to the test and participate in their first true FIRST® Robotics Competition. The competition was held in the newly-constructed Jiading Sports Centre in Shanghai, China. Two elimination brackets were played: one for all 56 teams competing, and one for just Chinese teams. Team 341 placed 12th overall, with 7 wins in 10 matches, and finished as CRC semi-finalists. The team was also honored with the 2016 CRC Inspiration Award to acknowledge the team’s efforts to help Chinese teams during the Robotics Maker Workshop. One of the team’s Miss Daisy mentored, Team 9036, also finished as semi-finalists during the Chinese elimination bracket. Wissahickon students learned about Chinese culture and the lives of Chinese students, making many friends along the way. The team visited ancient villages, the historic Yellow Mountains, and the beautiful sites of Shanghai. It was a mind-opening experience for every student and adult on the trip. International teams received financial support from the China Urban Youth Robotics Alliance (CUYRA) and Dadalele. CUYRA organized the Robotics Maker Workshop and CRC, in its 3rd year. It was announced on the last day of CRC that an official FIRST® Regional will be taking place in Shenzhen, China next March. Team 341 is a FIRST® Robotics team out of Ambler, Pennsylvania. The team was founded in 1999 and is an after-school activity designed to inspire young people to pursue careers in mathematics, science, and technology. In 2010, Team 341 was recognized as a role model team and was entered into the FIRST® Hall of Fame. The team is known world-wide as a leader in Science, Technology, Engineering, and Math (STEM) outreach. Alumni of Team 341 are improving our world at Google, SpaceX, Microsoft, Lockheed Martin, and Boeing. For Inspiration and Recognition of Science and Technology (FIRST®) was founded in 1989 and is based in Manchester, NH. FIRST® is a 501(c)(3) not-for-profit public charity designed to inspire young people’s interest and participation in science and technology, and to motivate them to pursue education and career opportunities in STEM fields. In an effort to bring the FIRST® experience to students around the world Team 341 has developed partnerships with schools in Singapore, UK, South Africa, Denmark, and Canada. In July of 2008, Team 341 joined other FIRST® teams and sponsors to bring FIRST® to a global audience at the Farnborough International Airshow in Hampshire, UK. Sponsored by BAE Systems, FIRST® UK, and Exscitec, the purpose of this three-day demonstration was to spark interest in FIRST® among UK students, schools, and companies. The event attracted large crowds, including hundreds of children who had an opportunity to drive Miss Daisy’s 2006 machine and view matches from the 2008 competition, FIRST® OVERDRIVE™. In addition to many local families, there were representatives from industry, education, and the government. Our team was even visited by a Member of Parliament: Phil Willis, chairman of the House of Commons Science and Technology Select Committee. We were invited by BAE Systems to help organize and to attend the show because we are widely known for mentoring other FIRST® teams and participating in large-scale robot demonstrations. Pennsylvania State Representative Kate Harper, who continuously encourages the endeavors of FIRST®, congratulated the team for their efforts in the UK. She has posted photographs from the airshow on her official website. FIRST® teams and sponsors combined efforts this past July to bring FIRST® to a global audience at the Farnborough International Airshow and International Youth Day, held in Hampshire, UK. Sponsored by BAE Systems, FIRST® UK, and Exscitec, the purpose of the event was to foster FIRST® awareness among UK students, schools, and companies. In addition, by participating in the event, FIRST® hoped to generate interest in a UK regional competition, as well as create more UK FIRST® teams. The three-day event attracted large crowds, including hundreds of children who had an opportunity to drive a robot and view 2008 FIRST® Robotics Competition (FRC®) matches. In addition to many local families, there were representatives from industry, education, and the government. A special appearance by British Parliament’s Chairman of the Select Committee on Science and Technology, M.P. Phil Willis, was a highlight of the event. “The effort was a win/win for BAE Systems,” said BAE Systems Engineering Manager and FIRST® Chair Sue Peckham. “The idea of inserting FIRST® teams into a premiere global air show made perfect sense because the forum not only showcases current technology but seeks to encourage future interest in aerospace science and technology. We weren’t surprised when our area was the most popular place for the families and students!” BAE Systems has supported FIRST® for more than 15 years and, last year, entered into a long-term strategic partnership. UK Farnborough Airshow teams participating from the US were Team 341 “Miss Daisy” and Team 217 “The ThunderChickens,” along with Team 122 “NASA Knights” mentor Joanne Talmage. Representing the UK were Team 1884 “The Griffins,” Team 2120 “The Yorkshire Terriors”, and Team 2448 “Ingenuity London.” The FIRST® exhibit included a 2008 playing field, an interactive FRC driving area, and several information booths with handouts and video displays. 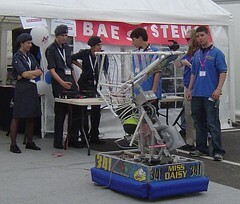 “Miss Daisy” from Wissahickon High School in Ambler, Pennsylvania, demonstrated its 2006 machine outside the Main Tent to attract a crowd, while “The ThunderChickens” and UK teams played simulated FIRST® Overdrive matches inside the tent. “Miss Daisy” was invited to attend the show because it is known for mentoring other FIRST® teams and producing large-scale robot demonstrations. In 2004, “Miss Daisy” created an instructional DVD called “Team in a Box” to help new teams get started with the FIRST® Robotics Competition. The DVD, which was handed out at the air show, explains how to build a robot, as well as what happens during a competition. This DVD can be ordered, free of charge, by clicking here. Team member Evan Ostrow said he thought teamwork was an important aspect of the FIRST® program. “I don’t think I would work as well with a group if I hadn’t been doing this,” added the 10th grader, who is also the son of the team’s leader. “This event was truly a team effort and shows what a handful of dedicated FIRST® people can achieve when they share a common vision. As always, we are thankful to our sponsors and would also like to recognize the US Embassy in Britain for their special welcome to the FRC® teams,” said Alan Ostrow, Team Leader of “Miss Daisy” and a physics teacher at Wissahickon High School. FIRST® has been dubbed a “unique varsity sport of the mind” designed to help high-school students understand what researchers and engineers do. Team Leader Ostrow said that in addition to providing inspiration to the students, the FIRST® program teaches them valuable lessons in community involvement and cooperating with people from diverse backgrounds. Ostrow said that “Miss Daisy” was honored to receive a congratulatory note from Pennsylvania State Representative Kate Harper, who applauded the efforts of FIRST® and has posted photographs from the airshow on her official website. In a warehouse, just 80 miles north of the equator and exactly halfway around the world, a wooden crate sat waiting for the arrival of its owners. In August 2006, a group of students from a robotics team in Montgomery County would travel to the City-State of Singapore to claim this freight. Inside the crate was a student-built, 130-pound robot affectionately nicknamed Miss Daisy. This machine was the product of a partnership between Wissahickon High School and the North Montco Technical Career Center. Not only was this machine built for entry into the FIRST® Robotics Competition, but it was also designed as a tool for inspiring others to pursue careers in the technological fields. The machine had already proven itself on the field of play by winning at several regional competitions, and was preparing to embark on its first international journey of inspiration. 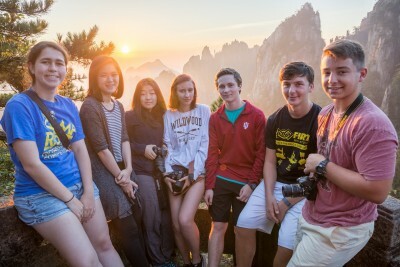 How a group of students from Montgomery County, known collectively as Team 341, found themselves in Singapore is a story unto itself. Team 341 is recognized both locally and internationally for mentoring new robotics teams. In 2004, three Singapore schools, the Millennia Institute, Temasek Secondary School, and the Convent of the Holy Infant Jesus Secondary School, contacted our team seeking advice on how to become involved in the competition. Over the course of two years, the relationship developed beyond basic advice and mentorship, into a true partnership of schools. This partnership has grown around a common passion for technology and a deep cultural curiosity. The bond has been further strengthened by a common philosophy. Although the central focus for both teams is the construction of a competition machine, both organizations believe that this mission is secondary to the goal of building people. Therefore we decided to visit our international friends. The students of Team 341 arrived in Singapore with goals surrounding academic, technical, and cultural exchange. Students and teachers participated in classes in the three different partner schools. Many of the classes, such as Science, were very similar in content to U.S. classrooms, but the physical environment was dramatically different. The open, airy campuses were filled with flowers, fishponds, and coconut trees. There were also unique subjects such as Mother Tongue classes, where Singaporeans learn the language of their heritage: Mandarin Chinese, Malay, or Tamil. American teachers were very interested to learn about Singapore’s world leadership in mathematics and Singaporean teachers were fascinated by the student independence built into our daily lessons. Teachers from each school also met to discuss best practices and agreed to continue exchanging curriculum. Detailed technical exchanges were also built into the schedule. Each school visit was highlighted by a school-wide robotics demonstration. The team performed for crowds of approximately 1500 people at each school. With high-energy robotics videos and audience participation, the team set out to inspire the crowd. Additionally, the team conducted a two-hour robotics seminar at the Singapore Science Center for an audience of educators and students. This conference focused on the details of robot construction and the logistics of starting a robotics team. Our students also had the opportunity to visit the Advanced Robotics Laboratories of the Nanyang Polytechnic, where they saw snake robots slither across the floor. In the hopes of gaining financial support for future exchanges, Team 341 also enjoyed the privilege and opportunity to make presentations at the US-ASEAN Business Council, American Chamber of Commerce in Singapore, and the United States Embassy. Cultural immersion was everywhere. Team members went on home visits, ate local foods (barbecued stingray), visited Hindu temples, and toured ethnic enclaves such as Little India. Many nights were spent sharing food and conversation with our hosts outside under palm trees or in open-air marketplaces. The students from both nations became very close and most importantly came to understand each other’s daily lives during these evening meals. Team 341 arrived in Southeast Asia with many lofty goals. Among them was inspiring the people of Singapore to pursue careers in math, science, and technology. But in the end it was the beauty of Singapore and the warmth of its people that inspired each of us to continue building this exchange program. This deeply felt experience has motivated our Singapore partners to make a return visit to Montgomery County this January and our students are counting the days until they will meet again. To learn more about the Singapore Exchange visit our singapore blog. As part of our ongoing effort to bring the FIRST® Robotics experience to students around the world, Wissahickon HS (Team 341) has developed a strong partnership with several schools in Singapore. In 2004 Wissahickon HS established regular correspondence with the Millennia Institute, Temasek Secondary, and the C.H.I.J. Secondary school. Our goal was to inspire these schools to join the FIRST® Robotics Competition as well as develop a cultural and technical exchange program with our high school. Just as we were establishing our partnership, FIRST® began piloting a more accessible, lower cost version of the FIRST® experience. This pilot, called the FIRST® VEX Competition, was a breakthrough moment in our growing relationship. This pilot allowed the Singapore schools to be introduced to FIRST® using smaller, more manageable robots. In early 2005 Wissahickon and the three schools from Singapore won grants which allowed us to establish three VEX Robotics Pilot Teams. We assembled one team at Wissahickon HS and two teams in Singapore. Our goal was to build three robots in a little more than a month and then compete together in Atlanta, Georgia at the 2005 FIRST® Robotics Championship. We felt that a critical step in developing this partnership would be to send a Wissahickon HS student to Singapore to help support the effort. Our search did not last long as team member Cheryl Neilson stepped right up to volunteer. Cheryl’s hard work in Singapore truly made a tremendous difference for these new teams. She extended her friendship, answered technical questions, and encouraged them to travel to America for the Championship event. American and Singaporean newspapers as well as Scholastic Magazine followed Cheryl’s journey which further inspired children in both countries. Both Singapore teams eventually went on to win the 2005 FIRST® VEX Challenge Award, the highest honor that the FIRST® VEX Competition had to offer. We were thrilled be a part of their early success at the 2005 Championship. Our common struggle and success has cemented our friendship and our partnership continues to grow. In January of 2006 twenty-five students and five instructors representing three Singapore schools visited with the students of Wissahickon HS and the North Montco Technical Career Center. They came to participate in a cultural exchange and compete in a FIRST® VEX Regional Competition. During their visit, students attended classes, visited with families and experienced American life. Visiting instructors observed lessons and exchanged teaching methods. The students also spent time together in the machine shop as Team 341 built its 2006 FRC® Machine. Then finally we competed together at the local FIRST® VEX Regional. Both FVC 45 (Wissahickon/North Montco) and FVC 46 Singapore SMART placed well and eventually faced each other in the semi-finals. Our Singapore partners had an amazing day winning the FVC Think Award and placed as the competition Finalist. We cheered on our international partners and the kids from both teams celebrated together on the bus ride home. A few days and several celebrations later we sadly parted company, but we knew this was not goodbye. We would see each other again in Atlanta for the 2006 FIRST® Championship. Once again our Singaporean partners arrived in Atlanta for the FIRST® Robotics Championship. We greeted each other upon arrival and then got right down to the business of competing. Team 341 prepared for FRC® and FVC 46 struggled through their FIRST® day. After a little bit of programming help and some minor changes Singapore SMART made an amazing comeback on the second day. Eventually they went on to win the 2006 FIRST® VEX Championship. We celebrated that evening by taking our friends to their FIRST® American baseball game. On Saturday the entire FVC 46 team came to the Georgia Dome to cheer on Team 341 as Miss Daisy placed 4th in the Galileo Division and took the Johnson & Johnson Sportsmanship Award. Later that evening we celebrated at the FIRST® Wrap Celebration and made plans for our team to visit Singapore in August. We are pleased to announce that Dr. K.T. Pang, director of the Singapore Science Center, has invited team 341 to hold a robot demonstration and sharing session at the Singapore Science Center on August 18th. The team will speak to an international audience of students, teachers, community members, government officials, and business leaders about the FIRST® Robotics Program, as well as the growing relationship between Team 341 and the schools of Singapore. While in Singapore, the students on the team will also attend classes, visit homes and sample life in Singapore. This exchange is an extension of our teams ongoing mission to develop international, technical partnerships which benefit students worldwide. Our exchange team will include 7 students, 1 college mentor, 1 high school principal and 3 coaches from both Wissahickon High School and the North Montco Technical Career Center. The team will also ship their 2006 competition robot, “Miss Daisy” for technical sharing and demonstrations. The team is very excited about this opportunity to speak at this prestigious national museum, exchange ideas with our partner teams, and inspires students around the world.